I know, I know, fondant is gross. I get that. But I can never understand bakers who stick to a strict no-fondant rule when it comes to cake decorating. Fondant has its place and, really, if you make it yourself, doesn't have to taste so awful. There are a million recipes on the internet for homemade fondant, and most consist of primarily melted marshmallows and powdered sugar. This one is no different, making it yet another recipe for "MMF" as bakers call it, marshmallow fondant. But the addition of a specific type of white chocolate and just a touch of butter makes this one, I think, the best MMF out there. First off, let's talk about white chocolate. White chocolate is not really chocolate because it doesn't have any...well...chocolate in it. But it does have cocoa butter, so at least there's something in there from the cacao pod. On the other side of things, you can get some really great authentic white chocolate from Callebaut and small-batch chocolatiers, but those I would save for, you know, just eating. My favorite white chocolate to work with in recipes is the Guittard Choc-au-Lait chips. They are the best tasting chips at their price point and they work as well in recipes as idiot-proof candy melts. Unlike other "white chocolates" at this price, Choc-au-Lait chips contain cocoa butter and are less sweet. I buy them in bulk. I recently made a square cake with this fondant and it performed beautifully--no tearing at the corners, no sagging, no cracking. I kept the cake simple as a plain background for the pale pink gumpaste peony I spent days working on. I have always been of the opinion that peonies look best in profile. Maybe because this shows off the cup-like petals better, for a more feathery, ruffled look. So I built up just one side of the flower and left the "back" somewhat flat so it would fit nicely against the side of this cake. The fondant this recipe makes is stiffer than regular MMF, and you'll find that once it is set up you will need to warm it in your hands by kneading it, or even zap it in the microwave to get it more pliable. But I love the texture of this fondant--it has body and weight, yet can be rolled very thin without tearing or bubbling because of its durability. It also tastes much better than most fondant I've tried, with the white chocolate flavor to balance out the sweetness of MMF. In a large bowl, melt the marshmallows in the microwave in 30 second intervals, stirring between bursts until completely smooth. Be careful not to overheat. Add butter, chips, then drizzle the water around the perimeter of the marshmallows to help loosen them from the sides of the bowl, stir with a spatula until chips are melted and mixture is smooth. Mix in powdered sugar, one cup at a time, using your well-greased hands to knead in the final two cups. Feel free to add a little more powdered sugar or shortening if mixture is too sticky. 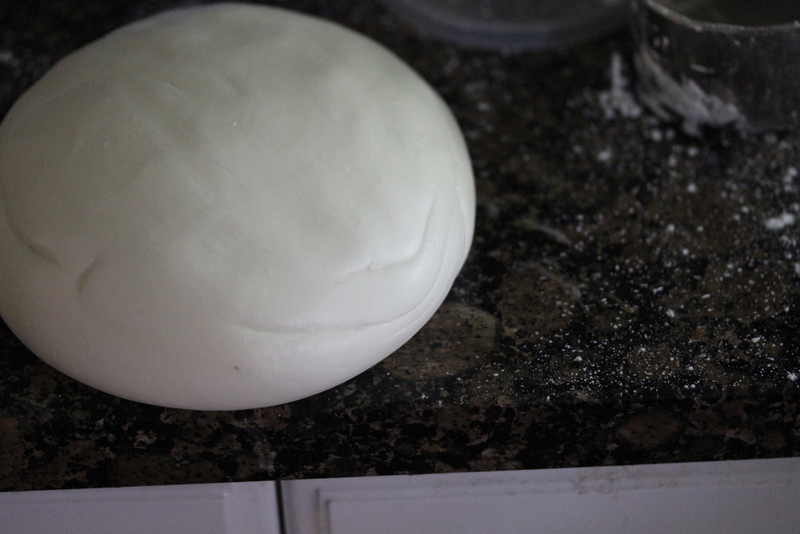 Knead until fondant forms a smooth ball, then coat with shortening and wrap tightly in plastic wrap and store in an air-tight container or zip-top storage bag. Because the white chocolate retains heat, the fondant needs to cool for at least three hours before using; overnight is best. It will stiffen as it cools.